Hello dear friends, I’ve missed sharing food with all of you! The cross-state move to ok a lot more adjustment than I expected but I plan to be back in the kitchen where I belong very soon. To celebrate, please share with me this amazing carrot cake! Somebody’s celebration of some sort is coming up, right? Birthday, baby shower, wedding, Thursday? (Yes Thursday is a holiday to me, because I love holidays and I want one every week!) Carrots are generally a spring vegetable at the farmers markets but are available year-round at the grocery stores and usually inexpensive, so there is never a bad time to make this. 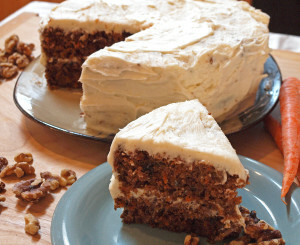 You will never think of carrot cake the same way after trying this. It is incredible. It’s from scratch, with actual carrots! There is NO boxed cake mix here. The hardest part about this cake is not eating the entire thing for dinner just because you CAN. A food processor for shredding the carrots and a stand mixer for mixing the batter are very helpful time-savers but not necessary so don’t let that stop you. Thanks go to the folks at King Arthur Flour for this recipe. Incidentally they are my preferred brand of flour – they don’t give me anything to say so, but if you are a baker, it’s good stuff. If you manage to have any leftovers, store them covered in plastic wrap in the fridge. Carrot cake is great cold for breakfast with a glass of milk. Go ahead, you deserve it! Gather and prepare the ingredients, including grating the carrots and chopping the walnuts. Preheat the oven to 350°F. Lightly grease two 9" round layer pans, or one 9" x 13" pan. Alternately, you could cut parchment paper to fit the bottom of the pan(s). Beat together the oil, sugar, salt, eggs, and spices. Mix the flour with the baking soda, and stir in. Add the carrots and nuts, and mix until just blended. Pour into the prepared pan(s). Make the frosting while you wait for the cakes to cool. Beat the butter and cream cheese together until smooth. Add the salt and vanilla. Beat in the sugar. Add a teaspoon of milk if the frosting is too stiff to spread; add additional sugar if it's too thin. Frost the sheet cake right in the pan. For the layers, frost the top of one layer, top with the second layer - turn the second layer upside-down so the nice flat side is up, not the rounded top - them frost the top and sides of the cake. This makes just enough frosting to do the whole cake so no eating spoonfuls of it, or you'll run out! This entry was posted in Desserts and tagged carrots, dessert, spring.